But Apple doesn’t seem interested in adding this feature to Apple Music, so I decided to build my own using Shortcuts. The result is the most complex shortcut I’ve ever created comprising over 540 actions. It’s not perfect due to the limitations of iOS and Shortcuts, but it’s the closest I was able to come to replicating Spotify’s excellent Wrapped feature. As anyone that’s played around with the Shortcut app will tell you, this is extremely impressive. I highly recommend reading the entire post from Viticci to see how he built it and what the limitations are. I ran it to analyze my top 200 songs and was surprised to learn I listened to Tonight Alive a lot more than I remembered. You can find my full report here, if you’re curious. I miss Rdio and I miss their “heavy rotation” feed. That was the right way to integration social features into a music streaming service. Apple Music have posted up the top artists and songs from 2018. Apple Music subscribers will be able to enjoy Apple Music’s 50 million songs on Echo devices. Customers will be able to ask Alexa to play their favorite songs, artists, and albums — or any of the playlists made by Apple Music’s editors from around the world, covering many activities and moods. […] Simply enable the Apple Music skill in the Alexa app and link your account to start listening. I’m more excited about this than I thought I’d be. The global chart can be found here. Apple Music has launched a new “Friends Mix” that will give you a list of 25 songs each week based on the listening habits of people you follow on the service. You can find this in the “For You” section of Apple Music. My “Friends Mix” looks basically exactly like you’d expect. If you want my spins showing up in your mix, feel free to follow me here. It’s been a lot of punk music lately. Apple appears to be rolling out a series of updates for Apple Music today, including a small but useful new section called “Coming Soon,” which allows subscribers to check out new albums about to be released over the next few weeks. […] In another addition, Apple is now making it possible to easily see album launch dates on their respective pages on iOS and macOS. In the Editors’ Notes section, following the traditional encouragement to add the pre-release album to your library, there’s a new line that begins “Album expected…” followed by the album’s specific release date. Some nice updates, but what I really want is one feed/section that simply gives me a chronological listing of newly released albums from people already in my collection. On Friday morning I should be able to look one place and see all the new albums from people Apple Music already knows I like and listen to. I’m cool with a smaller scattering of recommendations for new music I may like under that main list as well, but finding the newly released albums from artists I already love should be easy. Half the time I’ll forget I pre-added an album that’s out today and this kind of reminder would be great. Hell, so many of my friends don’t even know their favorite band released new music over the past five years. This is a solvable problem. 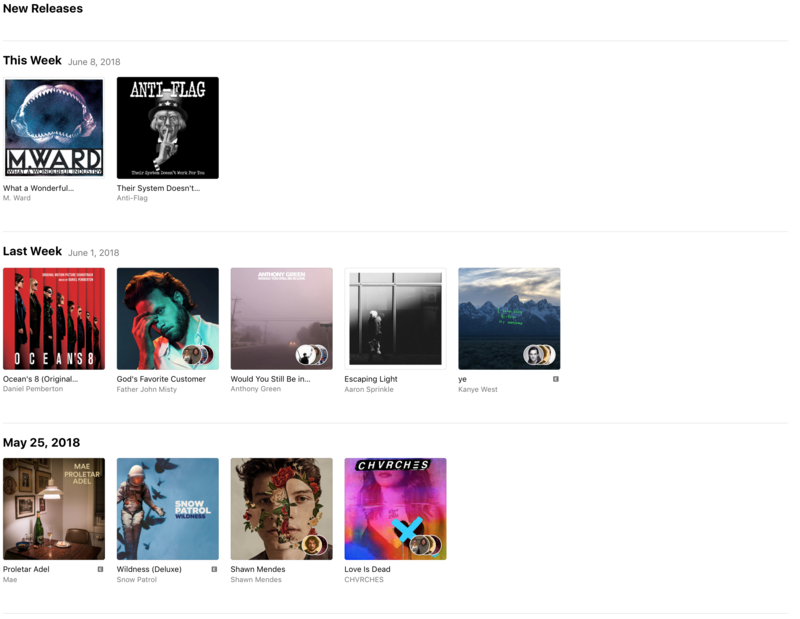 Update: I was just looking around in the new Apple Music, and I don’t know if this is new or not, but if you go to the “For You” section and scroll to the very bottom, there’s a “New Releases” section. Clicking “See All” seems pretty close to what I’m talking about. However, it’s definitely missing things from artists in my collection with new albums. For example, that Lykke Li album released today isn’t in my listing even though all of her albums are in my library. I want a “block artist” button on Apple Music (and Spotify). Something that I can click to keep an artist from ever showing up at all, anywhere, on the platform. Maybe even granular control so you could check one box to just block that artist everywhere, and another if you still want their “features” to appear in the tracklists for albums you listen to. I also think that these services should start looking into informing listeners on artist pages about things that someone may want to know before listening to an artist. These pages already have biographies on them, why not include the facts about abuse allegations as well?